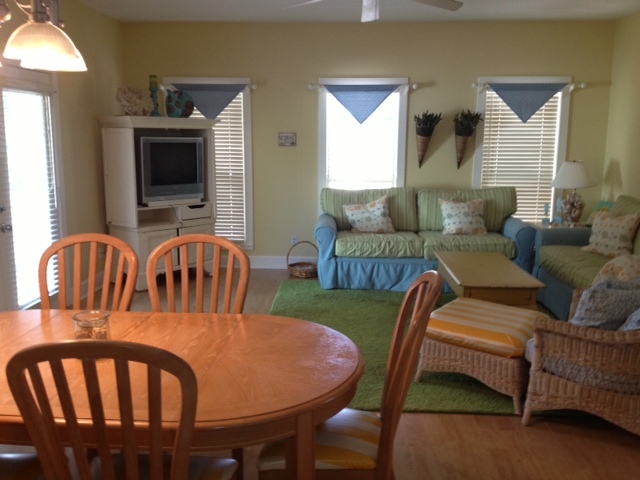 This quaint little rental house in San Destin was in need of a major facelift! We wanted the design to be more toned-down. 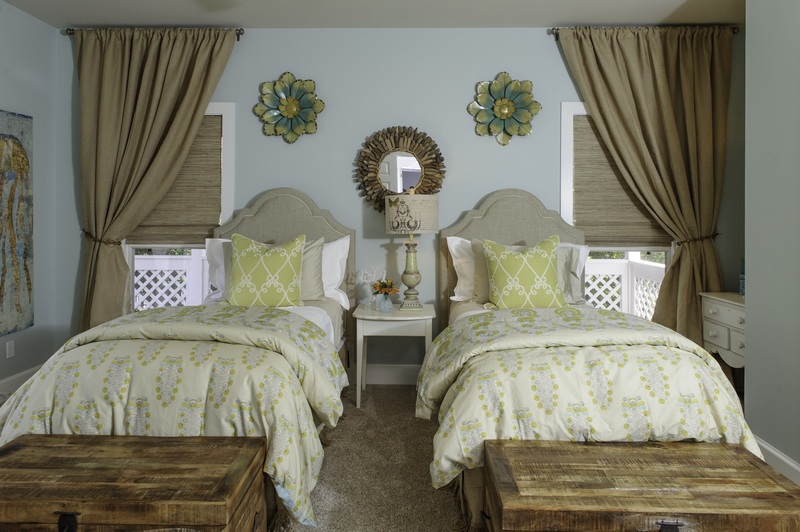 I love bright colors, but for this project, we thought the house needed to be quiet, relaxing and charming! 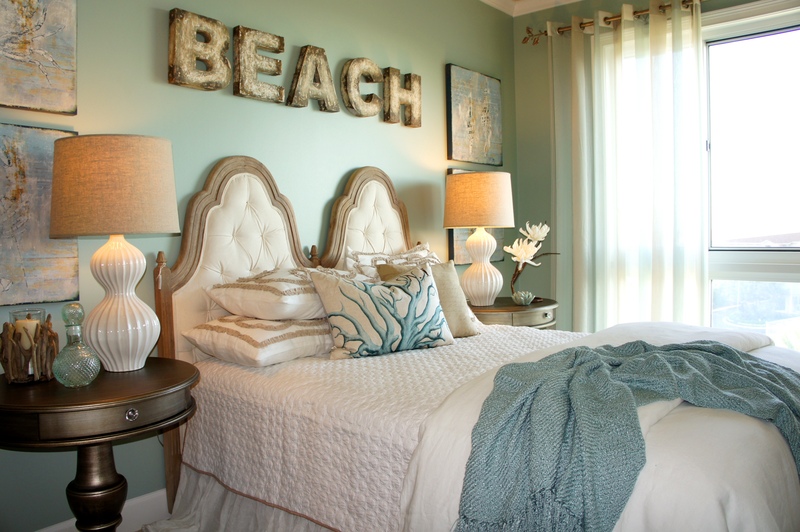 I brought in some coastal flair, and some cottage casual, as well as some light French influence. I gave the walls some “love” and attention, by applying beadboard up to 42″. 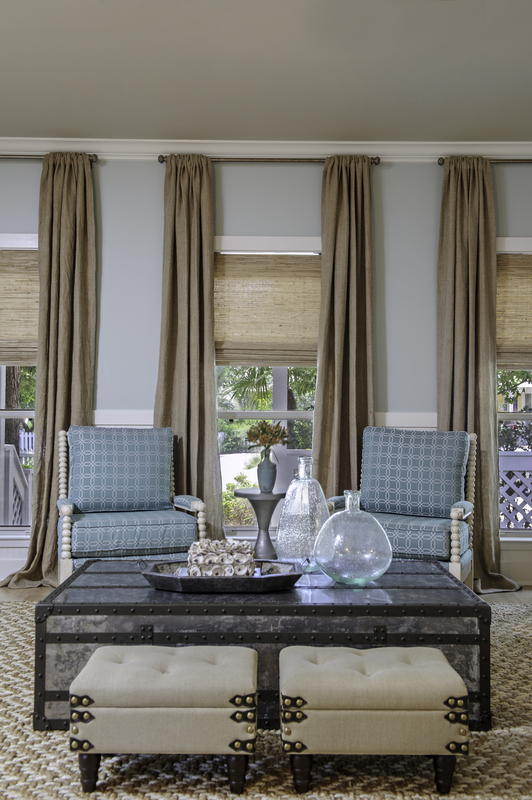 Grassweave Roman shades in the windows added texture, and the long burlap drape panels created some much-needed height and drama! 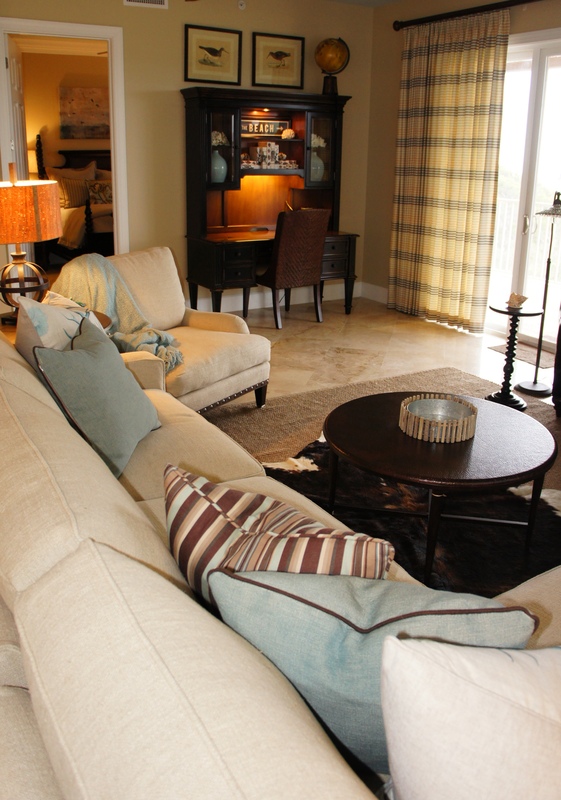 I felt that a sectional suited this space much more than a sofa and chair, which was crowding the staircase in the “before” photo. The large chest I used as a cocktail table actually has hidden drawers in each end! 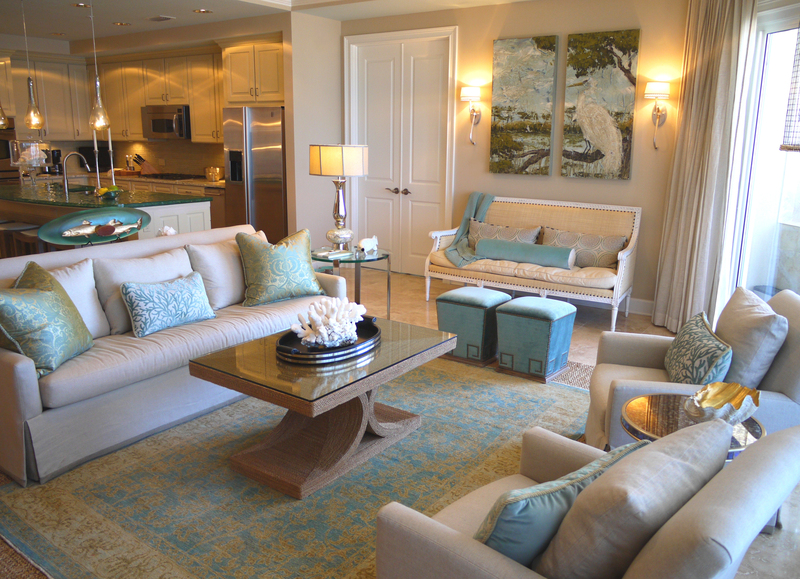 Nothing says relaxed like a great slipcovered sectional! 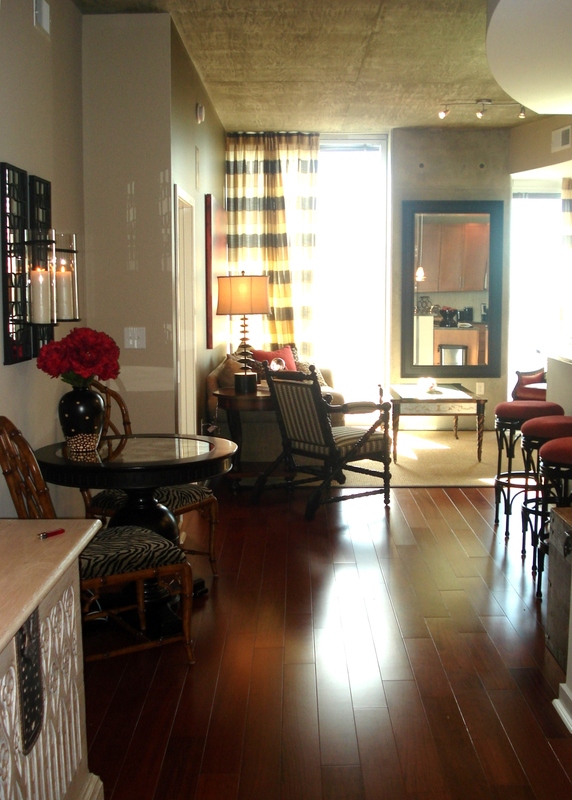 With the option to pull the cover off and wash it, it allows my clients to just relax and enjoy their space! The triangle valances were distracting, and the armoire was feeling bulky for that corner. 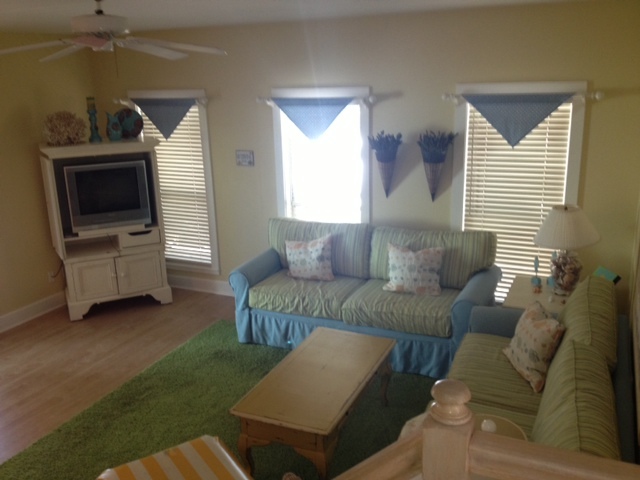 The denim, yellow and green color scheme was in need of a change. After I took this photo, we mounted a television on the wall above the console. This opened the space up and allowed for a larger t.v. Although the kitchen was not a separate room, it sure felt closed off from the rest of the space. I sought to explode this barrier and open this space up, so that the entire room felt larger! We didn’t want to replace all the cabinets, so what I did, is I replaced the upper cabinets only, and painted everything a new, fresh white. I placed glass cabinets above the bar to allow more light to spill into the kitchen. I placed some faux doors on the other side of the range hood vent so that we didn’t see a strange patch of drywall, like before. 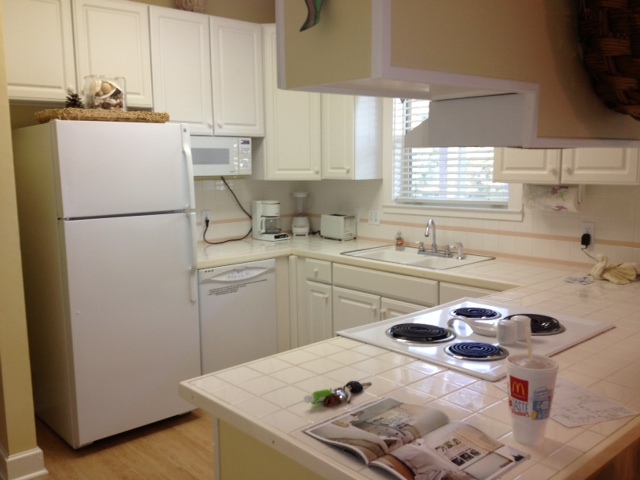 I replaced all the appliances with stainless, and installed a gorgeous slab of White Ice granite. I tiled the backsplash with ice blue glass tiles, which matched the wall color, and helped to hem the two rooms together. 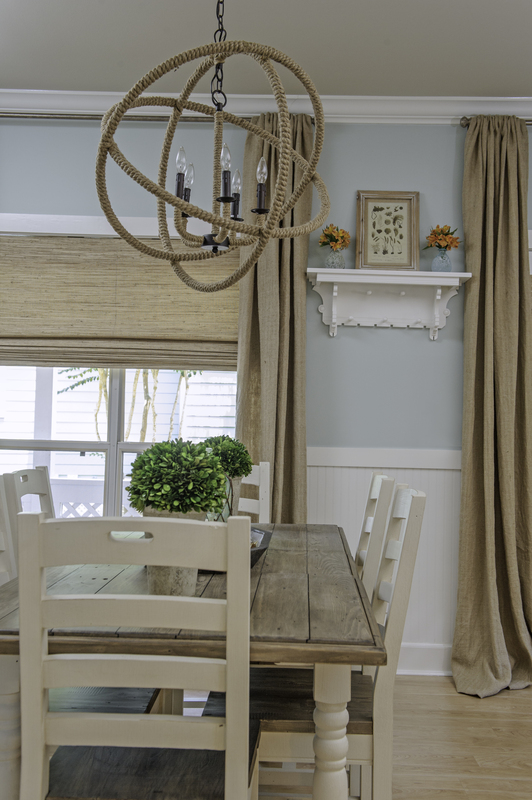 In the dining area, I chose a small farm table, with some ladder back chairs, and a fabulous rope chandelier! This coat rack/shelf was the only item I kept from the previous design! I repainted it white, and leaned some art on it. Now a quaint cottage bath! 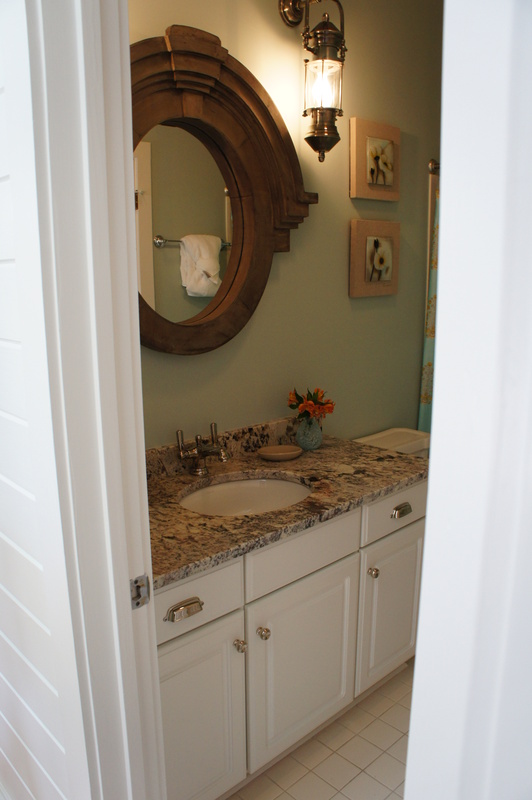 This small bathroom received a minor facelift, with major effect! Because the walls are blue in the main Living area, I decided to let blue be a small supportive role in this story. 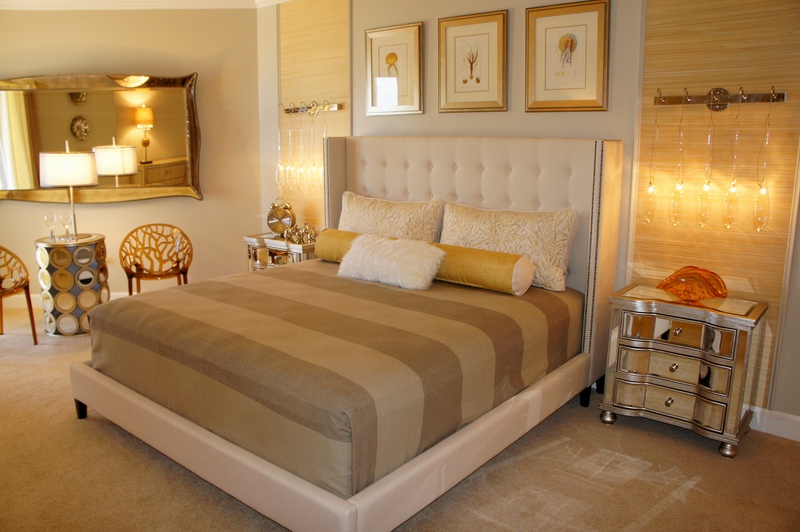 Instead, I painted the walls a rich camel color that blended with the shower drape fabric. 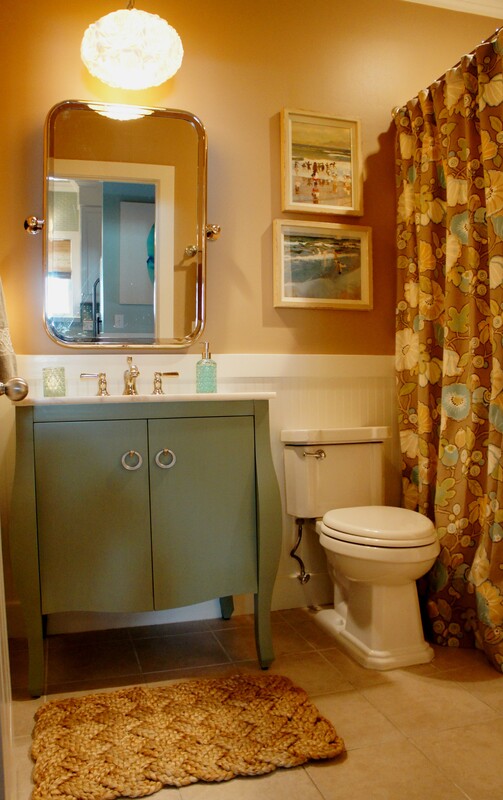 There are hints of blue in the drape fabric that I reinforced with this painted vanity sink. One way to instantly make your bathroom look more custom is to hang a shower curtain that is taller than the standard 72″. This one is about 84″ long. 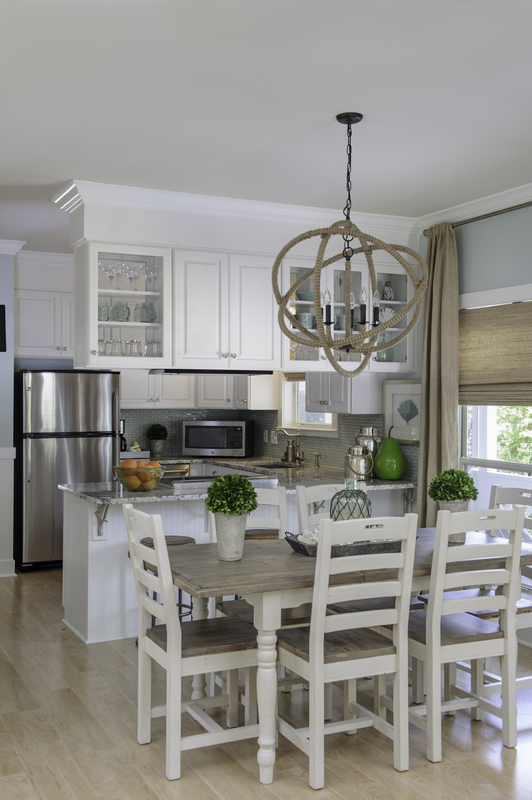 Applying beadboard is another inexpensive way to add a lot of character to a small space. We replaced the toilet with a more efficient one, added some cute art, and voila! A whole new space! 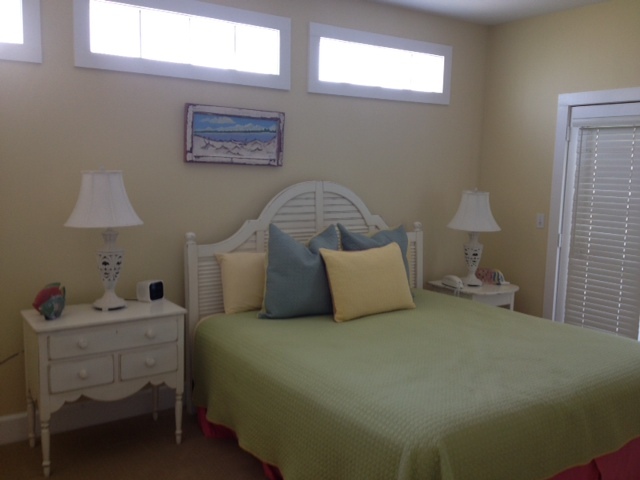 The Master Bedroom received new carpet, new grassweave window treatments, a fresh coat of paint and new furnishing! 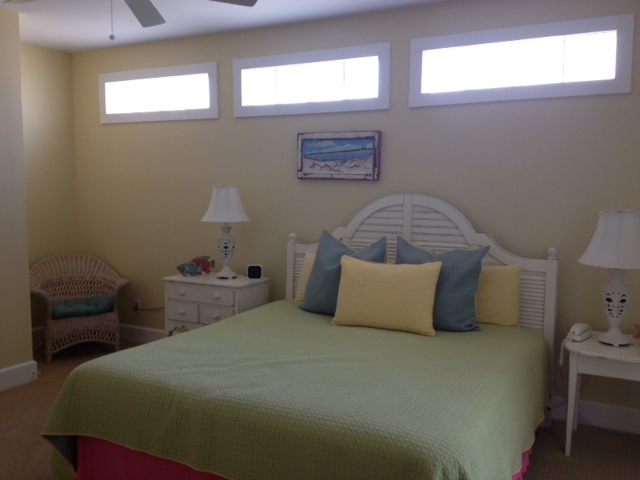 I centered the bed between two of the transom windows so that the placement made more sense. 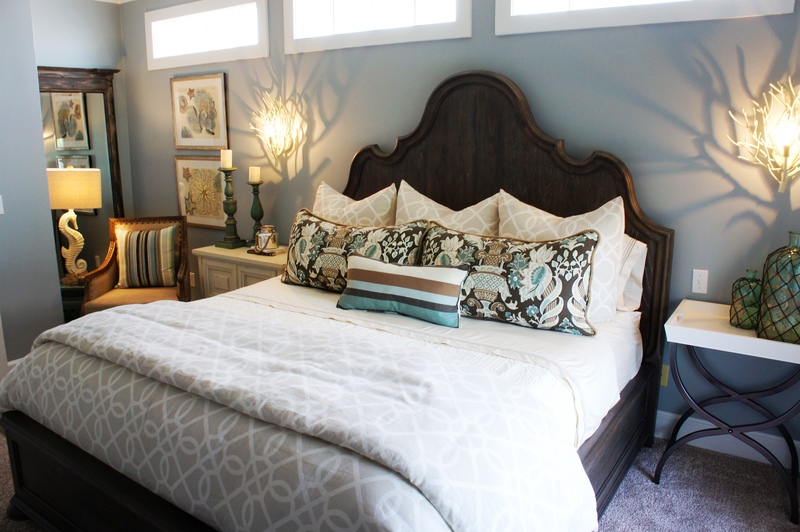 I flanked the bed with matching white twig sconces, and added some plush, inviting bedding. 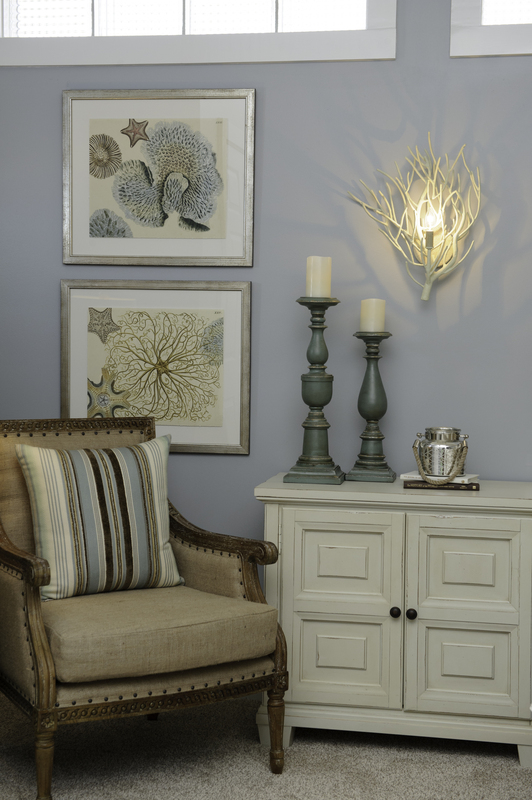 I maximized the recessed nook to the left by placing a floor mirror, a comfortable chair and some pretty artwork. 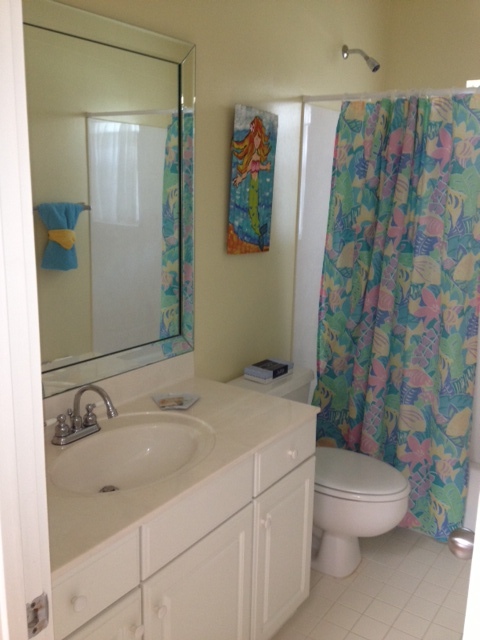 The Master Bathroom needed rescued from the 80’s “Florida” look! 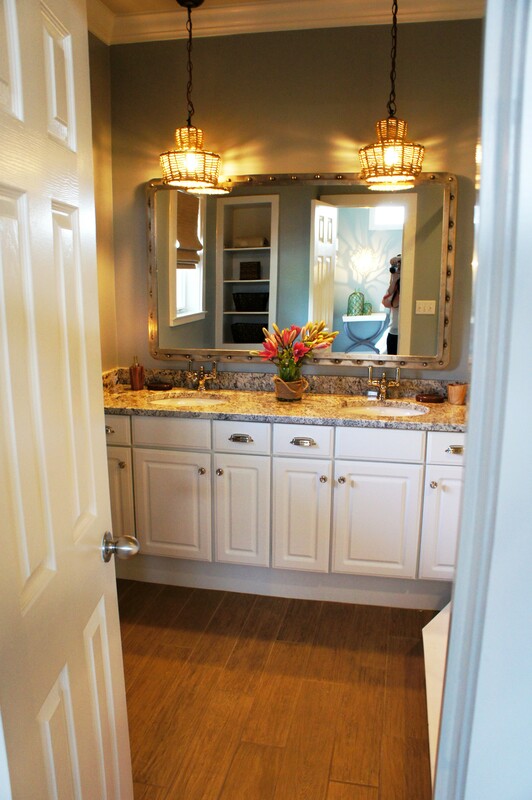 I raised the vanity sink on the left to be 36″, like the one on the right. 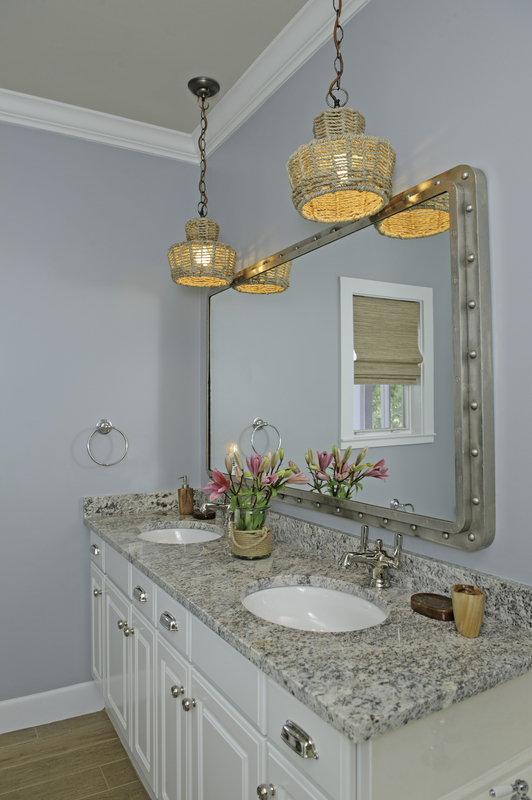 I installed one solid slab of granite, replaced the pink tile floors with some wood tiles, and polished the look with a nautical riveted mirror, some jute pendants and large art around the tub. New cabinet hardware from Restoration Hardware also did wonders for the new look. I almost forgot to mention what a difference paint makes! 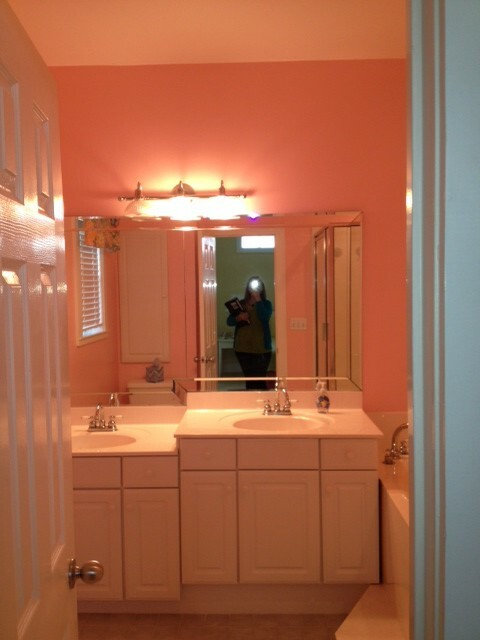 Bye-bye, pink walls! The loft turned out so pretty! The first thing on my list was to paint all the pink-undertoned wood paneling! This paneling covered the walls all throughout the hallways, and all the way up the 3-flight stairwell. The ceiling of the 3rd floor loft even had the same paneling. 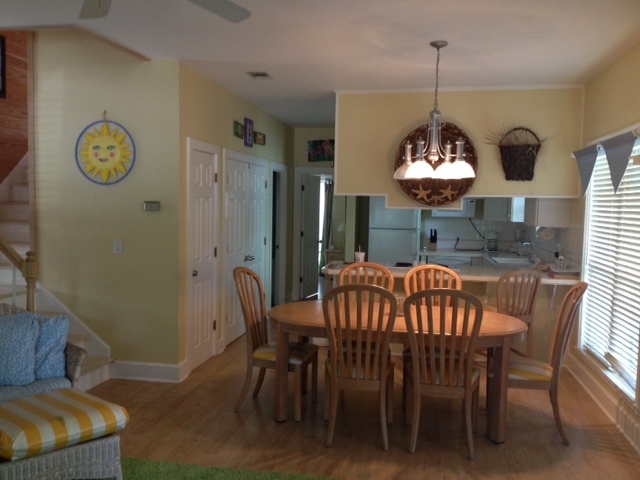 The wood is pretty, but in order to open things up and feel more coastal, I needed to paint all the boards white. 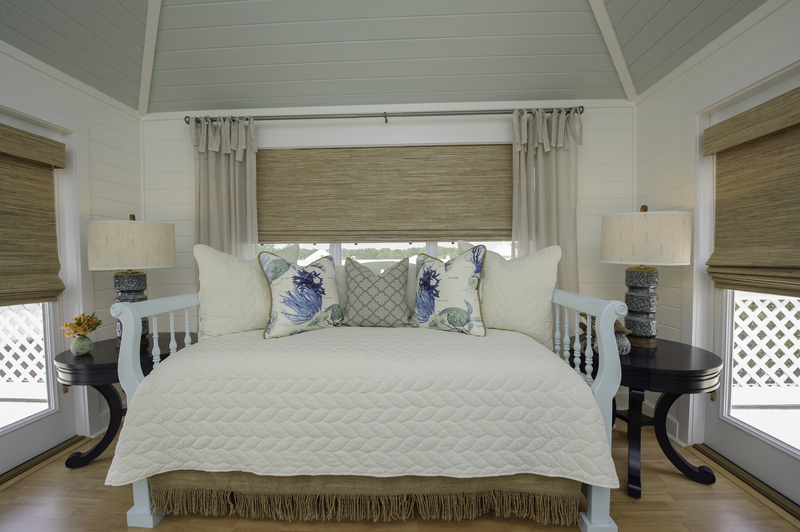 The wood ceiling received Palladian Blue paint, to mimic the sky and draw the eye up. 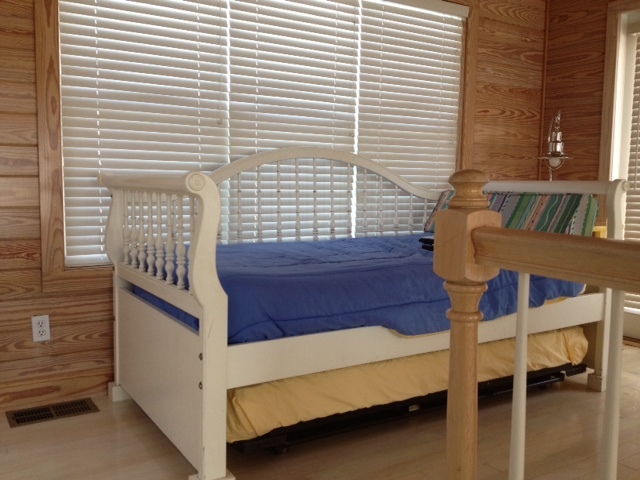 I kept their wooden daybed, and simply painted it an ice blue color! I added a burlap skirt, some new bedding and some navy end tables! Wow, where do I start? New everything, that’s where! 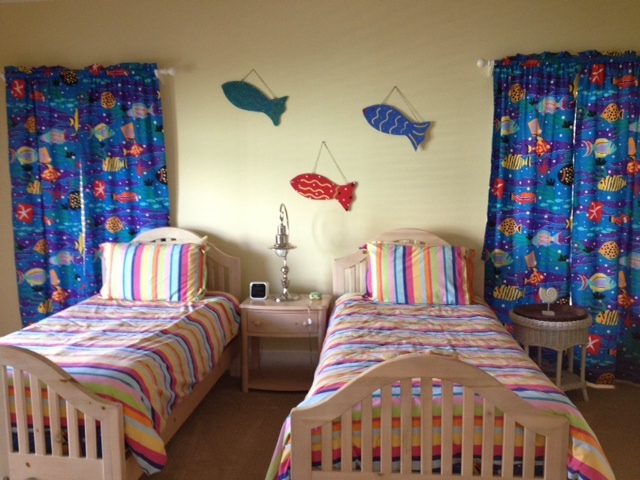 There are still two twin beds, but I implemented a much more toned-down design. 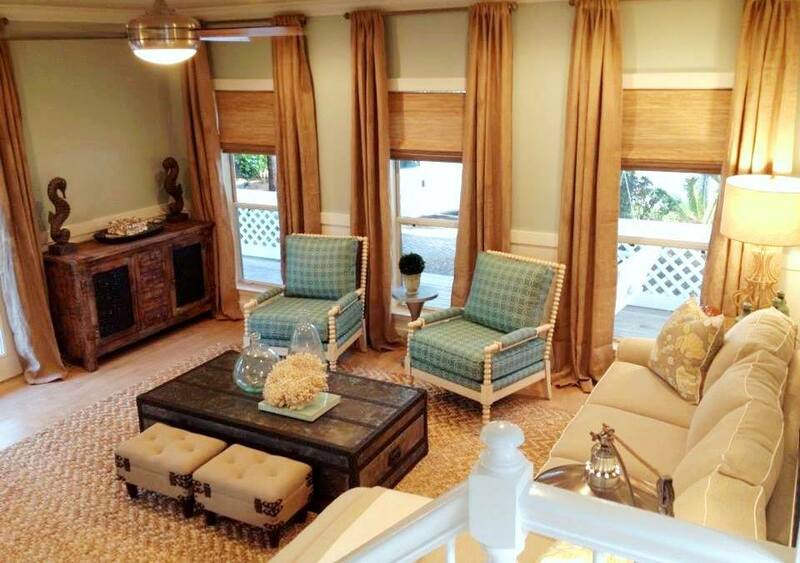 The floor-to-ceiling burlap panels help to dramatize the small windows. The bedding is actually ready-made duvet & coverlet from Bed, Bath & Beyond. 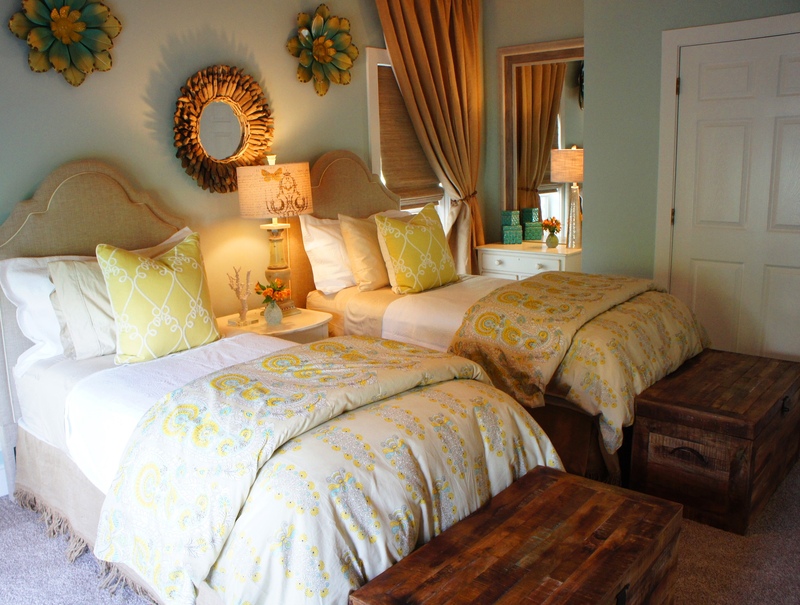 The bedskirt is from Ballard Designs, and the toss pillow is from the Lovelace Interiors Showroom! 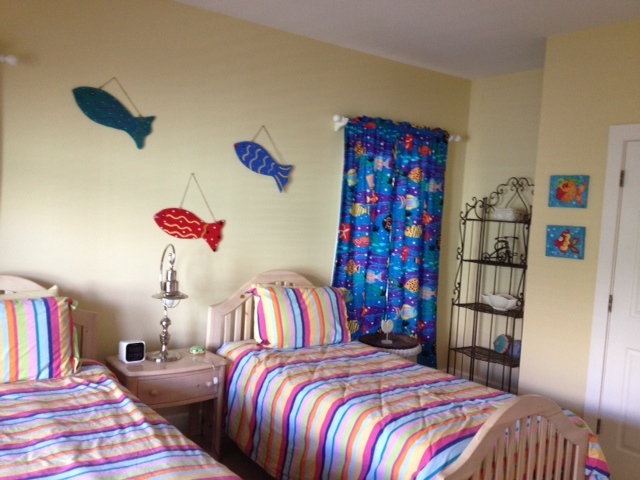 The reclaimed wood chests at the foot of the bed are a great place for toys, shoes, bedding, etc. They also make a great place to sit and put shoes on. 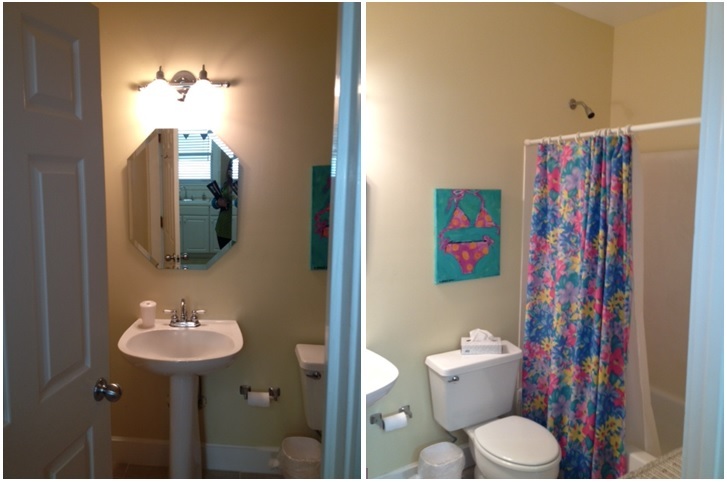 The second floor guest bathroom was a simple redo: new countertop, cabinet hardware, toilet, mirror and sconces! This made a great difference! 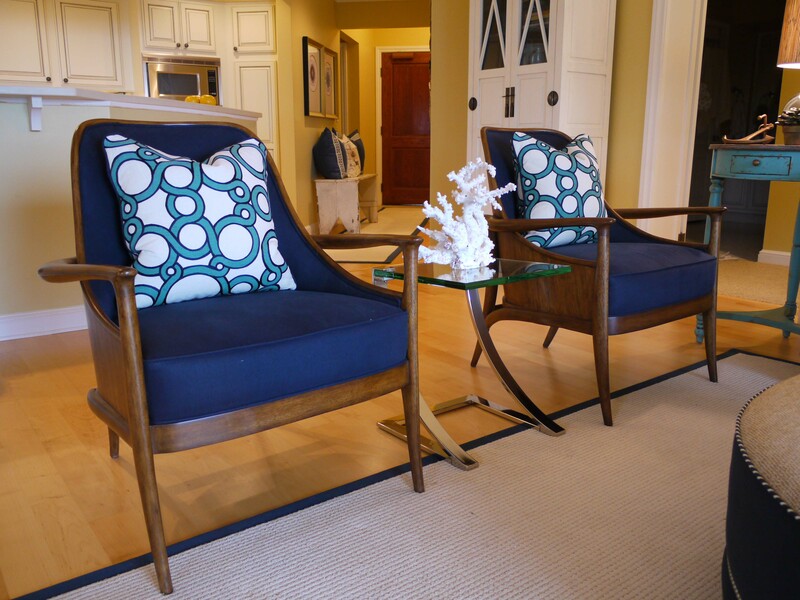 I thoroughly enjoyed working on updating this rental! Call me if you have a rental you would like updated! Facelifts like this will raise the value of your rental, and pay for itself! What color are the walls in the living room? Thank you! 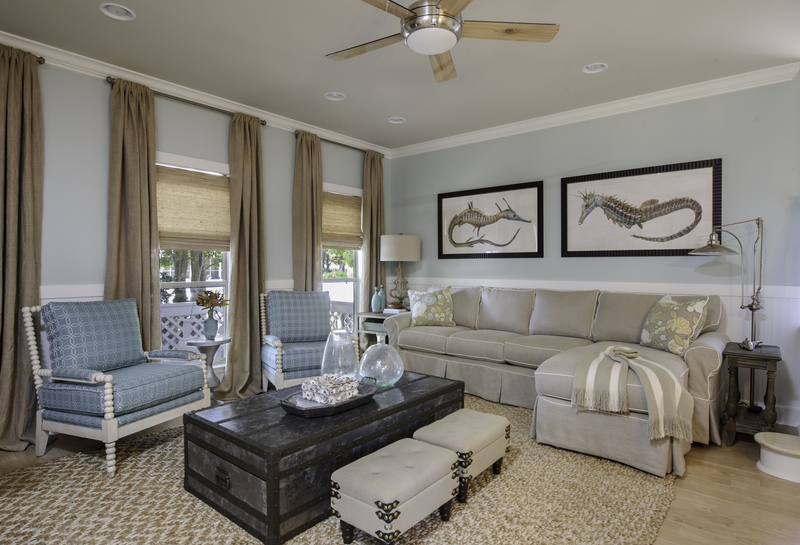 The living room walls are Benjamin Moore, Palladian Blue HC-144. One of my favorite colors! You are one talented lady!!! 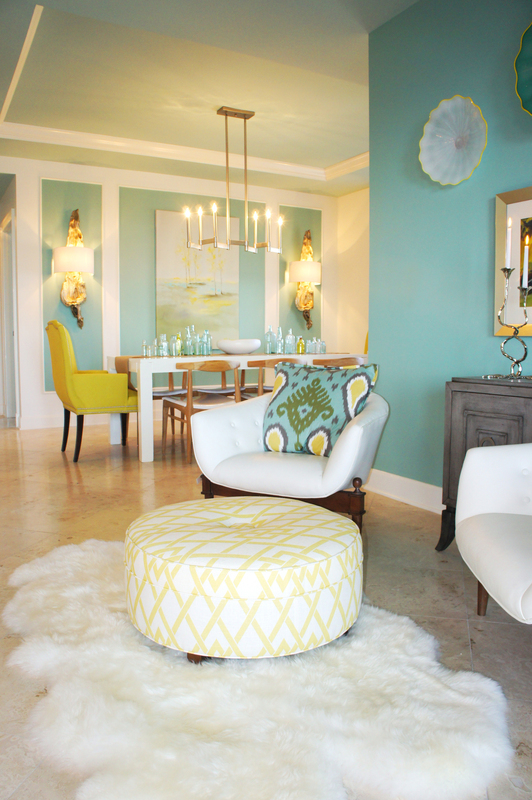 This is the first remodel that is perfect in every aspect. 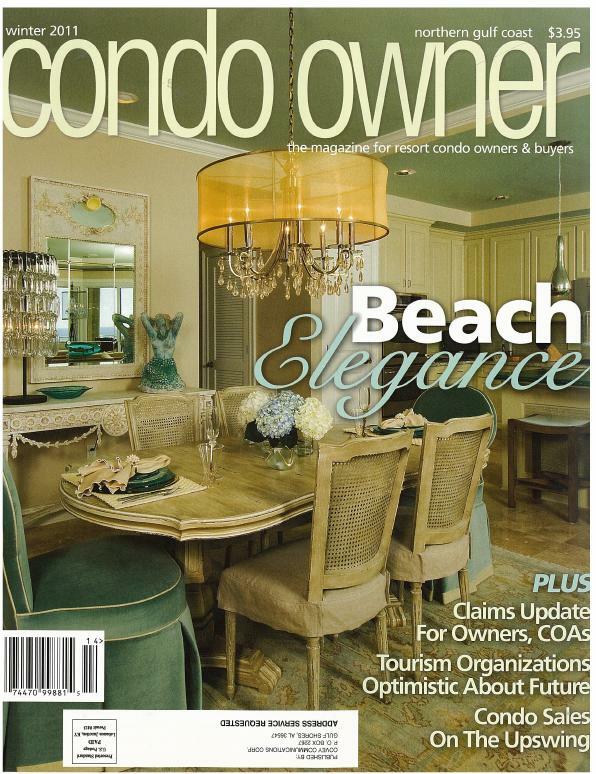 Would love to rent this place while we search for our own beachfront property . Thank you! I will pass this along to my client!